On March 17, 2013, I ran Into the Pit of Madness, the final entry in the Lair Assault program. This challenge’s outcome remained in doubt until the final die rolls—a perfect balance. The party came within a round of defeating the Essence of Evil, and the players all seemed to enjoy the session. As with Kill the Wizard, the challenge divides the party, randomly placing individuals in smaller challenges. I liked this design in Kill the Wizard, and welcomed the encore. For Kill the Wizard, a homemade Drowslayer figure inspired me to make a Drowslayer of my own. 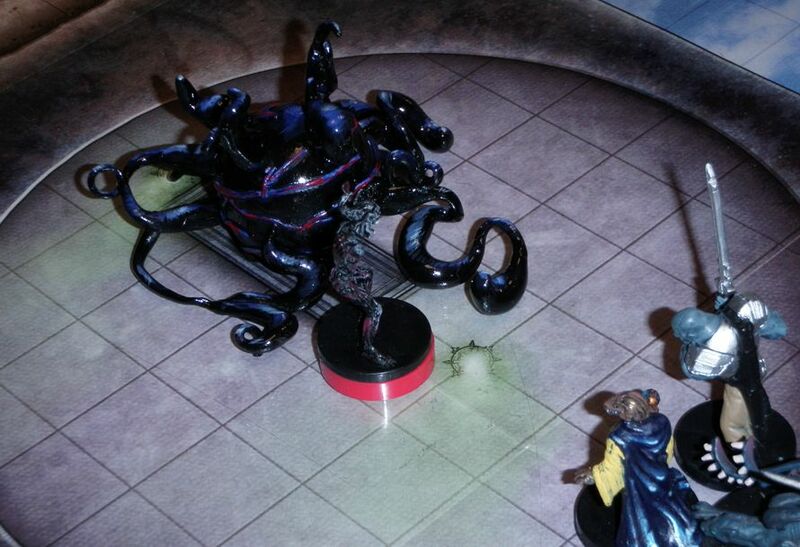 Into the Pit of Madness features a showdown with another unique enemy called the Essence of Evil, a creature without any available miniature. I failed to step up and make an Essence of my own, but Wendy and Curtis, the creators of that first Drowslayer, topped themselves. Check out this picture from of the Essence of Evil and an adjacent Babau. They sculpted the Essence of Evil from Sculpey oven bake clay and painted it in arterial red, malevolent black, and bruise purple. One of my tables in the last Lair Assault, Temple of the Sky God, succeeded in some measure thanks to a stockpile of multiple Sun’s Slivers, “a powerful artifact of pure sunlight” that serves as a MacGuffin in the epic-level Winter of the Witch adventure in Dungeon. Even when you select the Lair Assault option, the character builder offers Sun’s Silvers, and possibly other artifacts, as legal, zero-cost items. They’re free; take two! Are the players ingenious for stocking up on Sun’s Slivers prior to the Lair Assault? 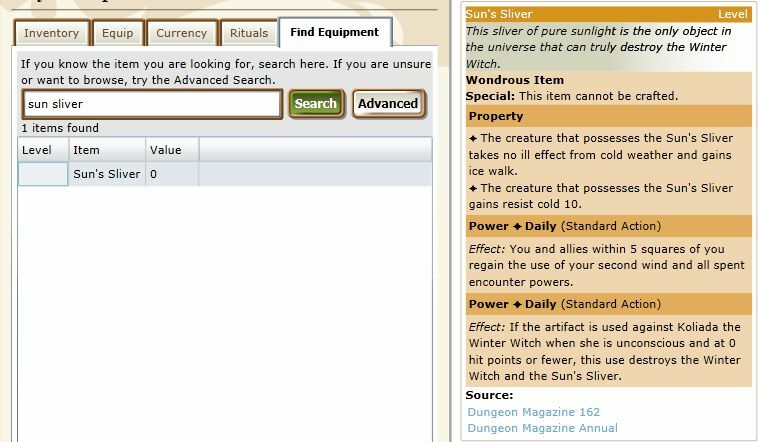 Is a DM abusing authority by forbidding players from equipping their characters with artifacts? I’ve run for players who would probably answer yes to both questions. In practice, I do not examine the character sheets, so I have no idea what equipment the players use. When I ran Temple of the Sky God for a team equipped with Sun’s Slivers, the party still came close to failing, and everyone had fun, so I call it a success. I leave it for the players to decide whether the cleverly equipped characters diminish the challenge. Still, I fault the character builder’s programmers for overlooking these shenanigans. When I ran Into the Pit of Madness and the characters reached the antechamber, a wizard easily made the 28-or-higher arcana check on the portal. The party included three characters well capable of hitting a 28 arcana DC. I reread the portal’s description on page 12 once again. “If a character with a check result of 28 or higher can see another creature moving through the portal, that character can choose the creature’s destination.” Does this mean that if someone in the party makes an Arcana check of 28 or higher, then everyone except the arcanist can short circuit the nodes and jump directly to the Black Cist? This interpretation seemed to invalidate so much of the challenge that I could not believe that it matched author’s intent. Did I miss something? With a minor action, a character trained in arcana who sees a portal may establish control over the portal. When that character sees another character pass through the portal, then the controller may, as a free action, attempt to route the passing character to a specific destination. For this attempt, make an arcana check. On a result of 28 or higher, the passing character travels to a node selected by the controller. Otherwise, roll randomly to determine the destination. On a result of 23 or higher, the controller can discern the destination of the passing character. Each time a character enters a portal, the controller must make a separate check. No more than one character may exercise control over a portal at once. I allowed similar checks for the portals in the nodes; I’m not a monster. With the characters at my table, this proved to be a fun and challenging approach to the portals. This entry was posted in Lair Assault, Miniatures and tagged Into the Pit of Madness, oven-bake clay, Temple of the Sky God. Bookmark the permalink.